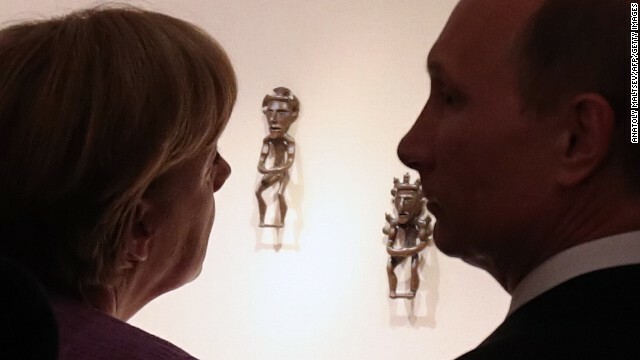 As tensions rise in eastern Ukraine, Germany may be the key to détente with Russia. “We are the West's number one modernization partner for Russia,” Markus Kerber, director-general of the Federation of German Industries told CNN’s Christiane Amanpour succinctly on Tuesday. Germany came in for some early criticism of the Ukraine crisis for being viewed as too soft on Russia, because of the massive trade and historic links between the two countries. Vladimir Putin and Angela Merkel were both behind the Iron Curtain in East Germany in 1989, when the Berlin Wall fell – she as a young scientist and Russian scholar; he as a KGB officer. They speak each other's languages fluently. But if diplomacy doesn't work, then German industry is publicly stepping up to refute the notion that billions of dollars in trade trumps the international rule of law. The West, Germany, and the European Union have thus far tried to raise the stakes for Russia by passing targeted sanctions against individuals and some organizations. They have thus far declined to institute industry-wide economic sanctions, which would undoubtedly have an adverse impact on all economies – Europe’s in particular, owing to its close ties with Russia. Those kinds of sanctions, Kerber said, are still a “long, long road” away, but Germany industry will support them if political leaders deem them necessary. Click above to watch Amanpour’s full conversation with Kerber. Dear Mr Kerber, you said " Germany's aggression took 20 mio russian lives". I suggest you to read the history better – Germany occupied the whole territory of Ukraine during the second world war. Amongst 20 million of lives taken during the war in 1941-1945 there were millions of Ukrainians, like my great-dad, who was not even 20. It is a shame not to remember and recognize that. I demand the apology on behalf of many Ukrainians who died in that war. By saying what you said today, you support Russian raising nationalism, which is growing like a cancer, and is comparable, if not worst, than the one of the nazi's back in 30s-40s. How about apologizing for making 20 century famine you call "holodomor" making look like something russians engineered to kill ukrainians and completely ignoring all the russian dead. Do you jump a lot, Victoria? Rule of universal inernational law would be fantastic. The interesting subtext is that the most prominent violator of rule of universal international law is the US. I wonder if the German speaker is being sarcastic? Ms. Shevchuk, does it really matter? Here in the United States, most individuals aren't even aware that the U.S. didn't rescue Western Europe from Hitler alone. The fact is that the Soviet Union took something like 25 times the casualties of many other nations. As peteybee points out above, the U.S. has such an incredibly poor international reputation (particularly in the Middle East) that it is borderline absurd to be lecturing Vladimir Putin about allowing Ukrainians to cede some region of the nation to the Russian Federation when the fact is that the reason it ever split into autonomy in the first place was due to my nation illegally manipulating the global economy with everything from price fixing to currency value manipulation to war. It is unfortunate that this situation isn't going to be popular with every individual that lives in Ukraine, never mind anybody in my part of the world that was subject to nearly 5 decades of anti-Russian false propaganda. Most in the U.S. age 35 and below either don't know what the Cuban Missile Crisis was or don't know that the U.S. is the cause for that incident.